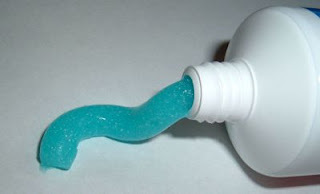 Not like the old days when squeezing from the bottom meant you got just the right amount of paste and the tube was always ready for the next person to use. Efficient. Can the inefficiencies of modern toothpaste tubes be a metaphor for modern times where people often choose the easy option, not realizing that it will actually mean extra work later on? I think so. The 'easy' option sometimes is deceptive. A little bit more thought can often reveal a better way of doing things that is actually less work. That's why I still squeeze my toothpaste tube from the bottom (not that this works very well when others in my family don't...*sighs*). I remember when toothpaste came in round metal tins with a different colour for each of the flavours ie: red, green, blue! Gibbs was the brand name. The toothpaste was solid rock texture, and you wet your tooth brush and scrubbed it around the solid paste where it would then foam up! Lasted ages! I think the colours were white, pale green for peppermint, and pink. I recall whenever tooth paste arrived circular metallic tins having a various color for every from the flavors for example: red-colored, eco-friendly, glowing blue! Gibbs is the brand. The actual tooth paste had been strong stone consistency, and you also damp your own teeth clean as well as clean this round the strong insert wherever it might after that froth upward! Survived age groups! I believe the actual colors had been white-colored, light eco-friendly with regard to peppermint, as well as red.